Delegates at the International Conference on Sustainable Biofuels took the opportunity to reinforce their commitment to international collaboration; a key factor in accelerating the development of a sustainable bioeconomy. The eight countries represented at the International Conference on Sustainable Biofuels 2018 held in New Delhi on February 26-27 adopted the “New Delhi Declaration”. 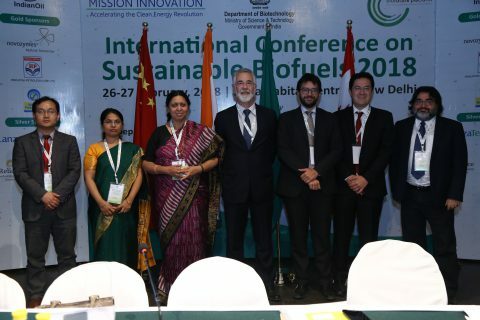 The four co-lead countries for the MI Sustainable Biofuels Innovation Challenge, Brazil, Canada, China and India, along with Finland, Mexico, the Netherlands and Paraguay, endorsed the consensus document. The New Delhi Declaration reaffirmed the need to press ahead with the actions set out in the Vision Declaration by the Biofuture Platform, issued during COP23 last November in Bonn, Germany. These actions focused on the need to reinforce international collaboration on research, development, demonstration and deployment of sustainable biofuels in order to mitigate climate change, enhance energy security, and promote economic development. continue and expand our existing conventional biofuel options and make these more sustainable. build up on multiple strategies for making drop-in fuels more efficiently and use oleo-chemical based drop-in biofuels as a bridge to lignocellulosic drop-in biofuels. An important recommendation from the conference was the need for collaborative research and development in sustainable biofuels for cost reduction and risk sharing. It was therefore positive to hear Dr Maria Georgiadou from the European Commission reporting that many MI countries are increasing public-sector spending on biofuel development. Furthermore, Mr Rasmus Valanko from the World Business Council for Sustainable Development stated that collaboration is needed between different government supported programmes on R&D for advanced biofuels, to ensure alignment with Mission Innovation objectives. Ambassador Mr J. Antonio Marcondes from Brazil emphasised the importance of private sector investment in this area. It was therefore very encouraging to see academic and industry researchers come together to discuss common themes. A recommendation of the conference is to continue this engagement. There was widespread recognition that progress is being made in advancing the bioeconomy. Examples of significant developments were presented, including India’s ambitious advanced biorefineries program. This program will see twelve commercial scale second-generation ethanol refineries come online in the next few years and help India fulfil its new mandate of 10% blending of ethanol into gasoline. Mission Innovation was acknowledged as an excellent mechanism to stimulate faster growth of the bioeconomy. The participants in the Sustainable Biofuels Innovation Challenge will continue to work together to address the challenges identified and grasp the opportunity provided by collaboration through Mission Innovation. More details on the event and the declaration can be found here.